We are a not for profit organisation dedicated to finding loving homes for ex-racing greyhounds that have plenty of pet years to give. We rely on a network of volunteers and foster carers to look after our dogs while they are waiting for their forever homes. Greyhounds are often overlooked, greyhounds are very loving, loyal friendly dogs who can live with cats, small dogs and other animals quite happily. They generally do not require a lot of exercise and are healthy and long lived for a large dog. Noodle is a beautiful boy that is handsome and cat friendly. 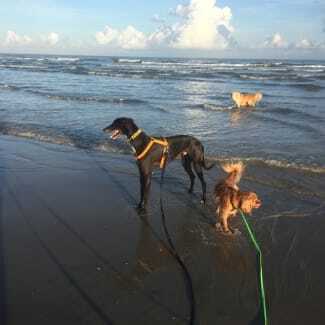 He loves other dogs of all sizes and enjoys walks on the beach. Can be shy at first but very loving once he settles in. 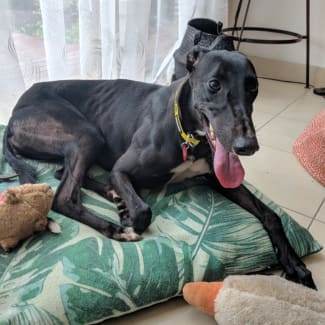 Frankie is a lovely female greyhound that enjoys snuggles. She is cat friendly, little dog friendly and child friendly. She deserves a home where she will be loved.